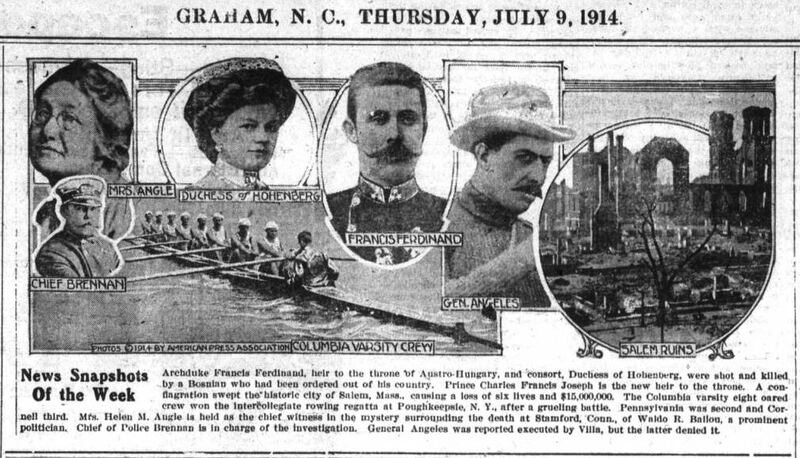 The Alamance Gleaner’s News Snapshots of the Week for July 9, 1914 included details of the assassination of Archduke Franz Ferdinand and his wife. 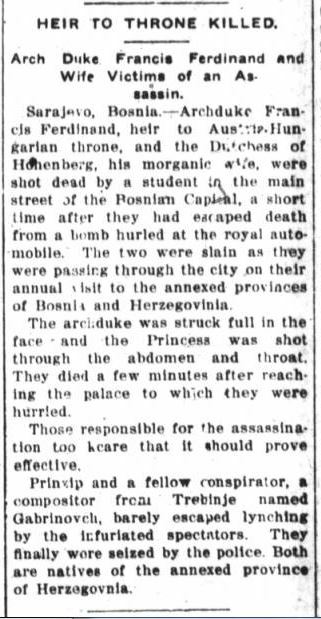 The notice of the Archduke’s assassination published by The Enterprise, The Hickory Democrat, and The Roanoke Beacon. July 2 notice of the Archduke’s assassination from The Courier (Asheboro). The Archduke’s assassination received mention in several of these papers. The Enterprise, The Hickory Democrat, and The Roanoke Beacon all printed the same column, shown above. Since the assassination occurred on a Sunday, the news had time to cross the ocean and reach editors before the weekly editions were published on Thursday and Friday. 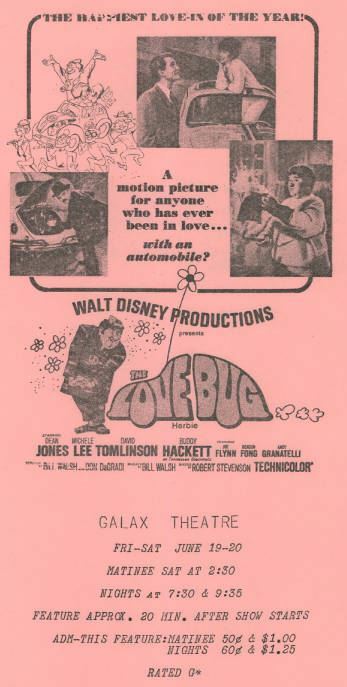 However, The Alamance Gleaner did not alert their readers to the event until the following week when it was included in the syndicated News Snapshots of the week (see top of post). Throughout July, tensions in Europe continued to escalate. By the end of the month, Austria-Hungary had declared war on Serbia and in early August, Germany declared war on Russia, France, and Belgium. This led to Britain’s August 4 declaration of war against Germany. Headline from the July 31 edition of The Carolina Home and Farm and the Eastern Reflector. 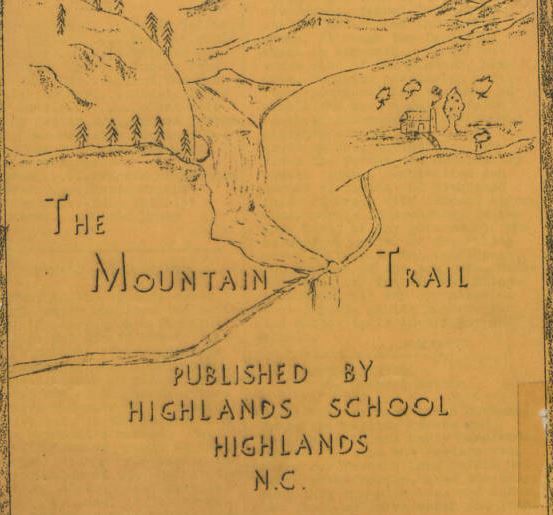 With the beginning of open hostilities, the conflict began to receive more attention in North Carolina newspapers. In the edition of July 30, The Alamance Gleaner ran a short column headlined “The War Dogs Aloose in Europe,” asserting, “It is now imminent that all Europe will be involved in a bloody conflict.” On the same day, The Mebane Leader published a column originally printed in The Charlotte Observer in which Serbia is compared to a copperhead snake. The average American may have been unaware of Europe’s rising tensions only a month ago. 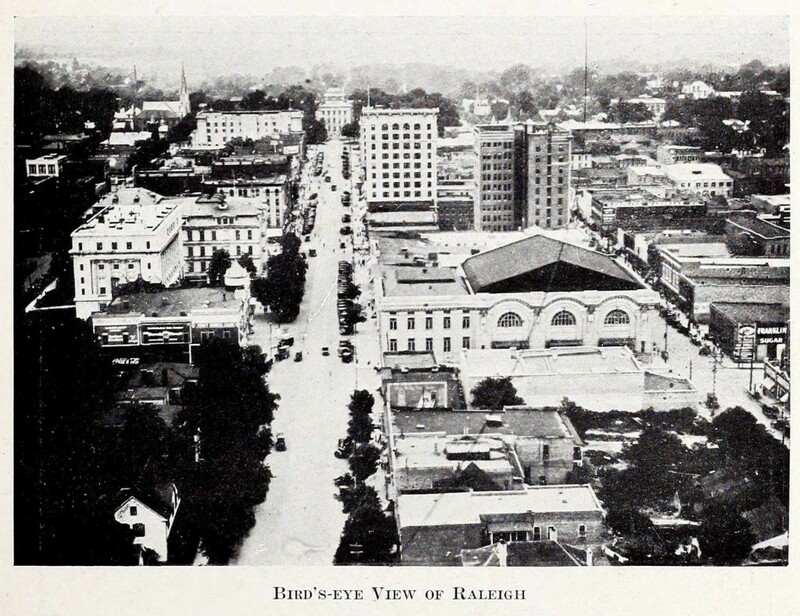 By the first week of August 1914, the tensions had boiled over into full-blown war, making the situation newsworthy to the citizens of North Carolina. 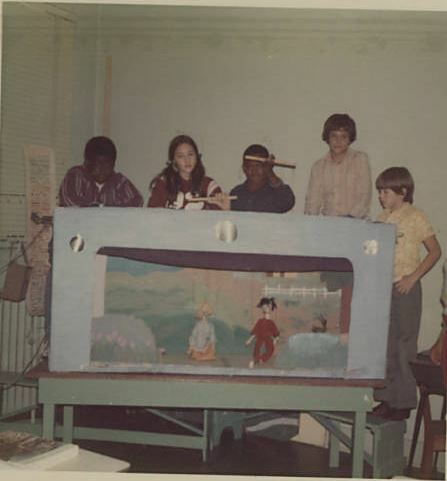 Sixth graders performing with puppets they built, November 1973. The North Carolina Digital Heritage Center recently completed scanning a set of materials from Montgomery County Public Library. 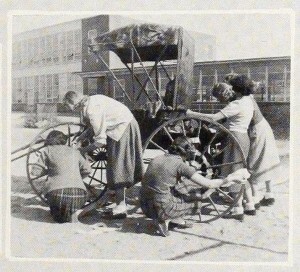 Included were several photograph albums featuring students at Troy Elementary School building and playing with marionettes. 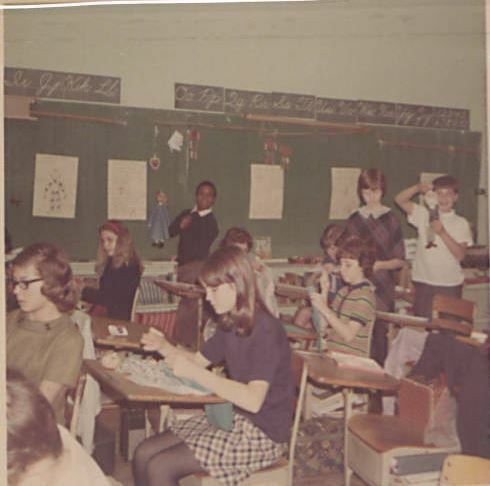 The albums belonged to Helen Poole, who taught the puppets class to sixth graders at Troy Elementary for many years. The albums span the 1960s-1970s. 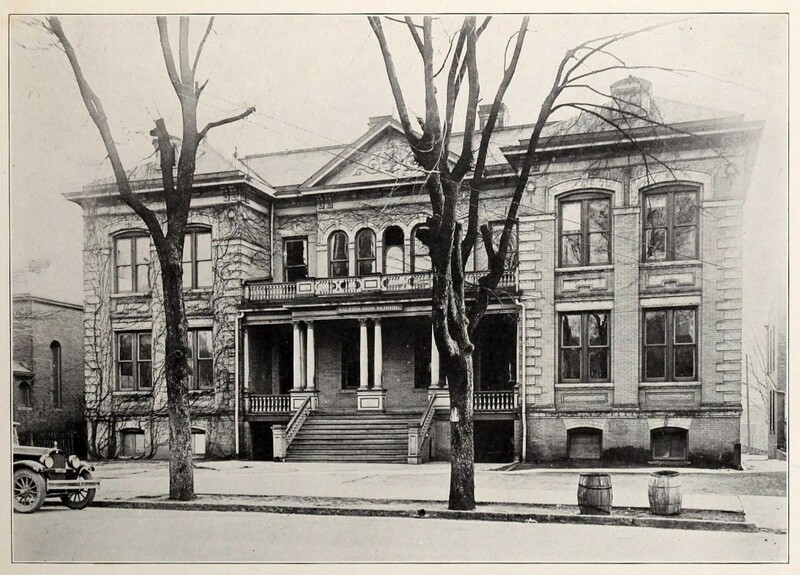 Douglas W. Brooks Library building, before it was converted into a library. Drawn by Jim Reese, 1977. 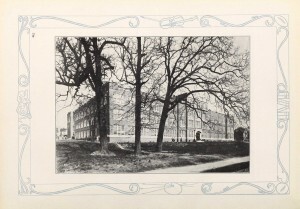 Other materials from Montgomery County include several items related to the history of the libraries in the county, including plans for the Biscoe Public Library, the dedication program for Montgomery County Public Library in 1979, and a drawing of the original Douglas W. Brooks Public Library. To view all materials on DigitalNC from Montgomery County Public Library, visit here. 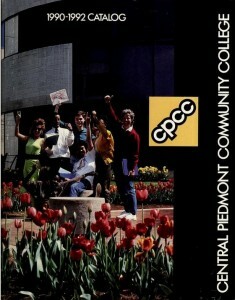 The North Carolina Digital Heritage Center has added a new partner, Central Piedmont Community College. 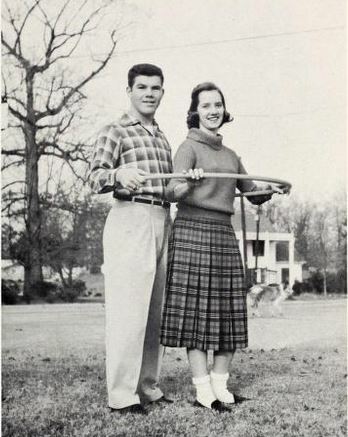 Thanks to this partner, we have just added to DigitalNC course catalogs from the college dating from it’s start in 1965 to 2002. 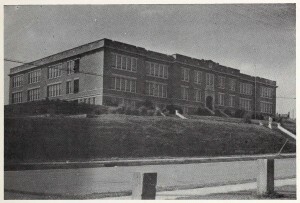 Yearbooks dating from 1962-1964 from Mecklenburg College, an African American college in Charlotte that merged with the Central Industrial Education Center in Charlotte to form Central Piedmont Community College in 1964, are also now online. 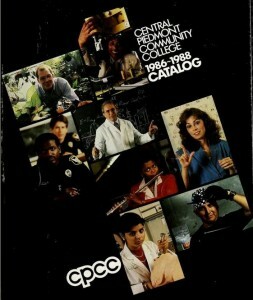 Cover of the 1990-1992 course catalog for Central Piedmont Community College. To view more materials from colleges and universities across North Carolina, visit here. 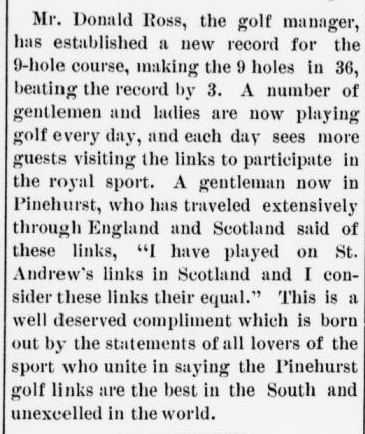 Much of the coverage of this year’s men’s and women’s U.S. Open golf tournaments in Pinehurst mentions the long history of golf in the community. 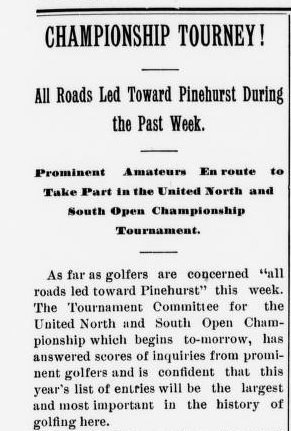 DigitalNC includes many resources that document and illustrate the history of golf in Pinehurst, including early issues of The Pinehurst Outlook, a weekly newspaper published for the town’s winter residents who had left their homes in the northeast in search of recreation and a more temperate climate. 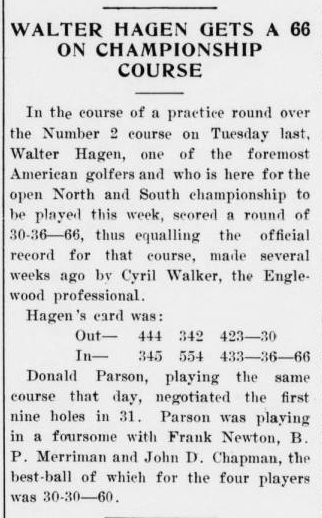 Here are a small selection of clippings from the paper, including some of the first mentions of golf in the late 1890s, news about course designer Donald Ross, an announcement of the opening of the famous No. 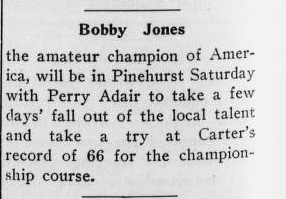 2 course, and news of well-known golfers in Pinehurst. 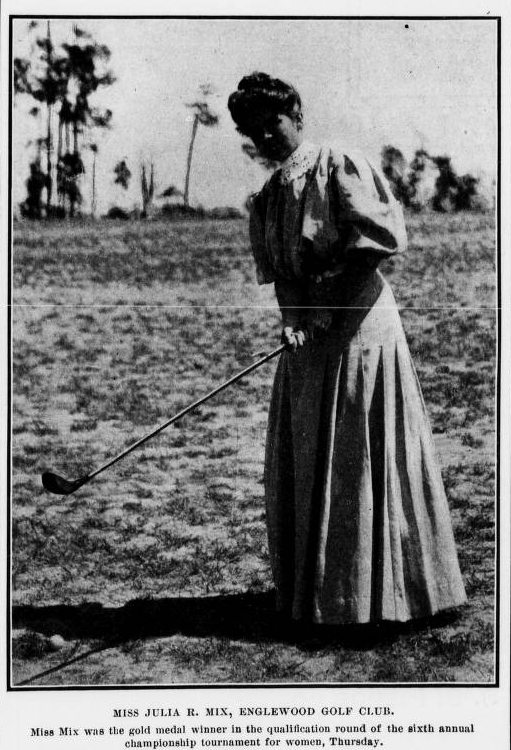 As the sporting world descends on Pinehurst for the U.S. Open this week, I thought it would be a good time to look at some of the terrific resources available on DigitalNC. At the center of all research on Pinehurst history is the Tufts Archives. Located in the Givens Memorial Library in the village of Pinehurst, the Tufts Archives is home to photographs, manuscripts, and artifacts related to the history of the town of Pinehurst. 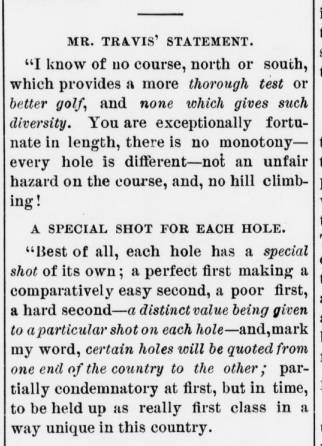 It is especially strong in the establishment of golf in the region, with papers of the legendary course designer Donald Ross. Yesterday’s New York Times had a feature on the renovation of the famed Pinehurst No. 2 golf course and talked about the importance of the Tufts Archives in determining the original condition of the course. The Digital Heritage Center has worked with the Tufts Archives to digitize and share online a small selection of historic photos from the collection. These include images of prominent golfers in Pinehurst, including Bobby Jones, Walter Hagen, Sam Snead, Ben Hogan, and a young Jack Nicklaus. T he Center has also digitized early issues of The Pinehurst Outlook, a weekly paper that started publication in 1897, just as the town was being developed as a resort community. 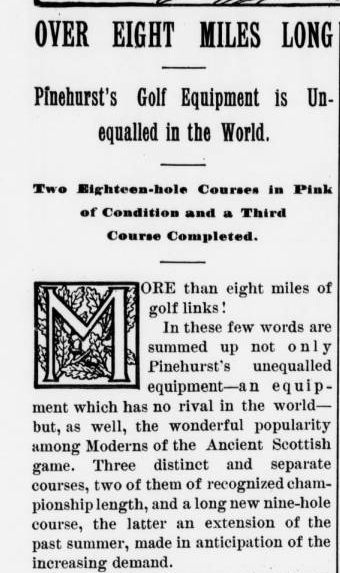 One of the earliest mentions I found of golf in the paper was an article from February 18, 1898, announcing the completion of the first golf course in Pinehurst, a nine-hole course modeled after the famed St. Andrews course in Scotland. The course included “a thick growth of rye” which was kept short by a flock of sheep. 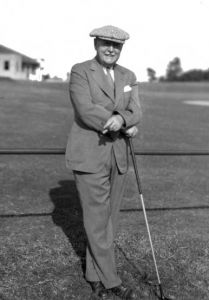 These early issues of the Outlook also include many mentions of Donald Ross, who was at the time not known as a designer but simply as an accomplished golfer available for lessons. 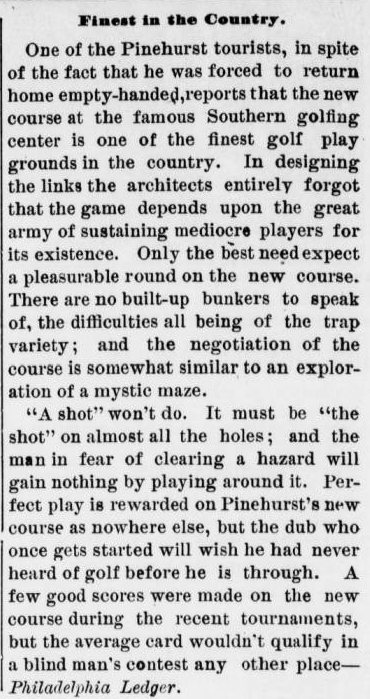 The paper reported on Ross’s ongoing improvements to the courses and the steadily growing interest in golf in Pinehurst. Also available on DigitalNC are more than 20 years of issues of The Pilot, from the neighboring community of Southern Pines. The Pilot has always done a terrific job covering the local community and these early issues include many articles about golf in the region. Keep up with the Digital Heritage Center on Twitter where we’ll share more highlights from Pinehurst history this week and next. Four scrapbooks featuring baseball players who went into the big leagues from Wayne County are now online on DigitalNC. From Sunday Star Sports, a Washington, D.C. paper on April 17, 1949. President Harry Truman threw the opening pitch at the game that day. Two of the scrapbooks feature Ray Scarborough (1917-1982), a pitcher from Mount Olive, NC who played for the Chicago White Sox, Boston Red Sox, New York Yankees, Detroit Tigers, and Washington Senators, and he served as a scout for the Baltimore Orioles. During his time on the Yankees, they went to the 1952 World Series and Scarborough was a scout with the Orioles when they went to the World Series in 1966. The scrapbooks have a mix of materials from his baseball career and as a boy growing up in Wayne County and as a student at Wake Forest University. The materials in the scrapbook are a mix of photographs, letters, and newspaper clippings and cover the 1940s through 1980s. 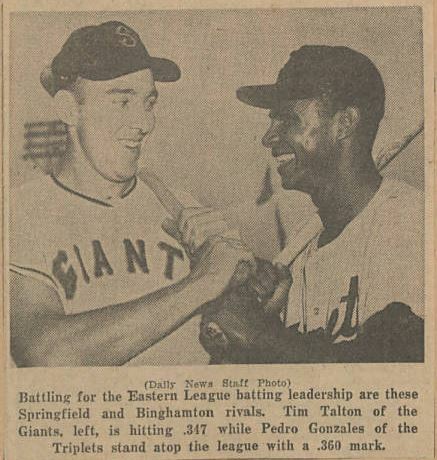 Tim Talton and his rival for top batting average in the Eastern League Pedro Gonzalez in 1960. The other two scrapbooks feature Marion (Tim) Talton of Pikeville, N.C., who played as catcher for the minor league teams the St. Cloud Rox in Fargo, ND and the Springfield Giants in Springfield, MA. Known for his exceptional hitting, Talton had the second highest batting average in the Eastern League in 1960 with a .331. One scrapbook covers his time on the St. Cloud Rox in 1959 and the other, his time on the Giants in 1960. Talton moved up to the major leagues in 1966 and played for the Kansas City Athletics. 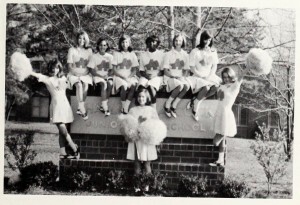 The scrapbooks were made available through Wayne County Public Library. To view more baseball materials in DigitalNC, visit here. Yesterday the North Carolina Digital Heritage Center staff visited the Oliver Nestus Freeman Round House Museum in Wilson, N.C. 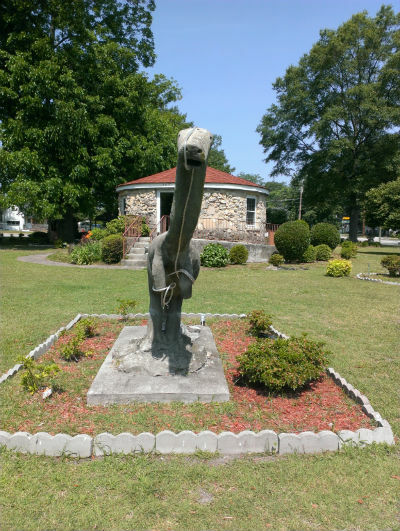 The museum celebrates African American history in Wilson County and honors the memory of Oliver Nestus Freeman, a local stonemason and builder who had a fascinating life and career. Stone dinosaur created by Oliver Nestus Freeman; Round House Museum in the background. Photo by Kristen Merryman. Freeman was a Wilson County native, born in 1882. 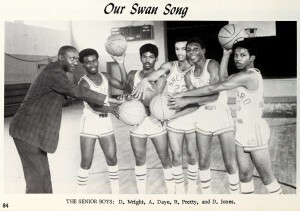 He attended the Tuskegee Normal School where he gained experience in construction and masonry. He returned to Wilson in the 1910s and worked as a mason for decades. He worked on many projects, incorporating a distinctive style using a variety of stones of different shapes and sizes. Many of his projects are still standing in Wilson today. In addition to his masonry work, Freeman was also known for the animals he kept at his house. The yard was filled with wild birds, rabbits, a goldfish pond, and several small bears. It became a sort of a tourist attraction with residents and visitors stopping by to give peanuts to the bears. One of Freeman’s most distinctive buildings was the round house he built in the 1940s to rent to veterans returning from World War II. The house had fallen into disrepair by the 1990s when it was chosen by local citizens to serve as a new African American history museum. The house was moved in 2001 to its current location at the intersection of Nash and Hines streets near downtown Wilson. The museum contains photos and documents commemorating African American pioneers and leaders in Wilson and includes a nice display of photos and artifacts from Freeman’s life. The museum is open for visitors and is well worth a visit next time you’re in or passing through Wilson. There is more information on the their website. 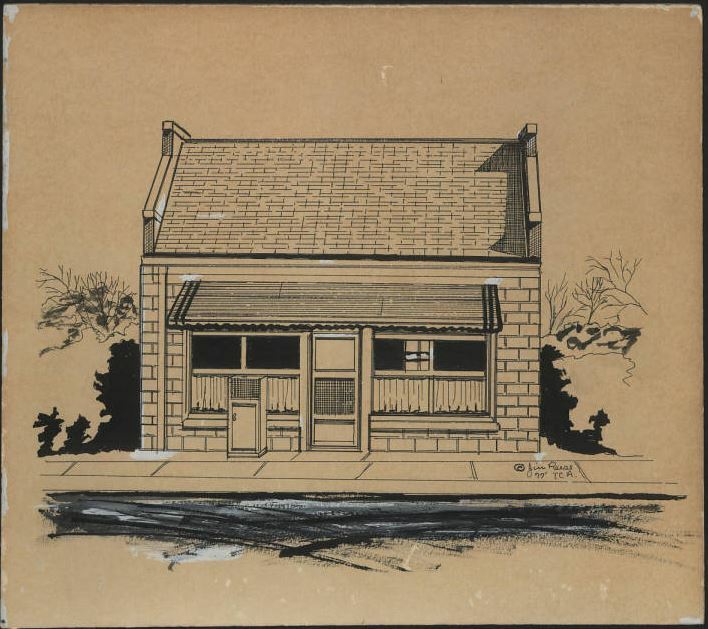 Learn more about Freeman’s work on the North Carolina Architects & Builders site from the North Carolina State University Libraries.